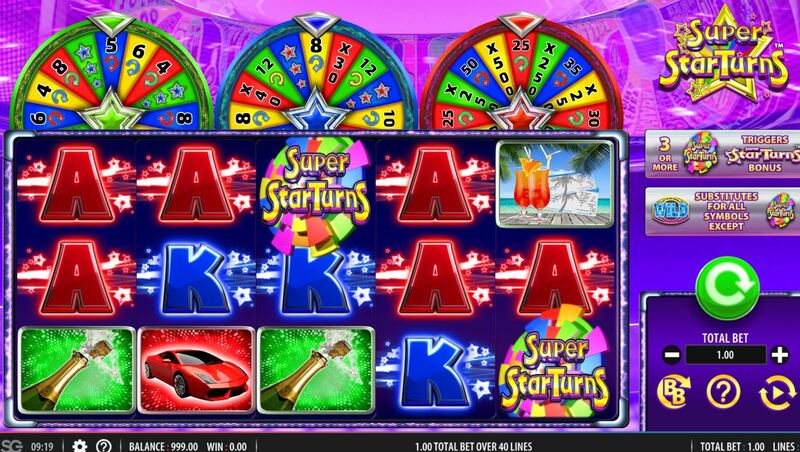 Super Star Turns slot from Barcrest is clearly modelled on IGT's Wheel Of Fortune model. To be precise, it's similar to the Triple Frenzy or Triple Extreme Spin version although this game is not trademarked and uses a generic theme. The appearance represents the trappings of wealth like Cryptologic's old classic Millionaire's Club III and we listen to cheesy jazzy music that's annoyed viewers of TV game shows for decades, as we spin. Will we survive the manic musical racket here to see if this super star turns our bankroll around too? We have stacked symbols here and 40 lines over a grid of 5 reels of 3 rows each. The top pay is the single Wild at 250x stake for 5-of-a-kind, Ferrari 5x, Banknotes 3x, Champagne 2.5x and Pina Colada 2x. The three card values pay 1.5x Ace and 1x for K or Q. There are scatters on all reels with the game logo and absolutely no random modifiers here. You can choose to spin at 20, 30 or 50.00 to buy a cluster of 5 spins only. if you do, the 5OAK pays above are raised 2x, 3x or 5x respectively except for the 250x for 5 Wilds which rises to 500x bet in all three Big Bet amounts. In all cases your scatters rise to 2-rows high, on the 30.00 bet you get enhanced prizes on the Star Turns Wheel, and the 50.00 raises them yet again. Three or more scatters will trigger this. You have a Green Wheel, Blue and finally Red. You begin on green for the basic 3 scatters and naturally 4 or 5 scatters will trigger the blue or red one respectively. Green Wheel - offers upgrade to Blue Wheel or 4-8 Free Games. Blue Wheel - offers upgrade to Red Wheel, cash 20-50x bet or 8-12 free games. 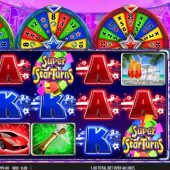 Red Wheel - offers cash of 250-500x bet or 25-50 free games. The above is self explanatory aside from the free spins. These have the card values removed from the reels and there is no retrigger but a stacked scatter appears on reel 5 which awards 1,2 or 3 extra spins depending on how much of it is in view.